In the 17th century, the area along the turnpike road through Bagshot Heath (now the A30) was known as a haunt of highwaymen, such as William Davies – also known as the Golden Farmer[a] – and Claude Duval. The land remained largely undeveloped and uncultivated due to a sandy topsoil making it unsuitable for farming. In A tour thro' the whole island of Great Britain, written between 1724 and 1726, Daniel Defoe described the area as barren and sterile; "a mark of the just resentment shew'd by Heaven upon the Englishmen's pride… horrid and frightful to look on, not only good for little, but good for nothing". A brick tower was built on top of The Knoll in the 1770s, by John Norris of Blackwater. It may have been used for communications but there is no firm evidence. The remains are now known as The Obelisk. The town as it now stands has its roots in the building of The Royal Military College, which later became the Royal Military Academy, Sandhurst, in 1812. A settlement known as "New Town" grew in the area around the college which in 1831 was renamed Yorktown, after Prince Frederick, Duke of York and Albany. At this time, the population was 702. In 1848, the first parish church of St. Michael, Yorktown was built by Henry Woodyer, in an area formerly part of Frimley, itself only a chapelry of Ash. Later, the Staff College was established to the east of the Academy, and a property speculator built the nearby Cambridge Hotel. The surrounding area became known as Cambridge Town, but was renamed "Camberley" in January 1877 to avoid confusion by the General Post Office with Cambridge in Cambridgeshire. The renaming of Camberley was mentioned in the 1963 film adaptation of William Golding's Lord of the Flies. The character Piggy states that the new name consisted of three parts; "Cam" taken from the original name of Cambridgetown, "ber" which means 'river', because there are many rivers in the area, and "ley" because it is a common ending for English town names in the area (as in neighbouring Frimley); although the name was actually derived from the "Cam" stream which runs through the town (mainly underground), "Amber" Hill which was marked on John Norden's map of the area in 1607 and "ley" usually meaning a clearing in the woodland. Hugh Edwards, the child actor who played Piggy, attended Camberley Primary School which was demolished[when?] to make way for the town centre redevelopment. During the 19th century, Camberley grew in size. This was given added impetus with the arrival of the branch-line railway and railway station in 1878 and a reputation for healthy air, due to the vast number of pine trees, which were said to be good for those suffering from pulmonary disorders. By the end of the century the population had reached 8,400. Since then, the town has absorbed the original settlement of Yorktown, which is now regarded as part of Camberley. The Southern Scott Scramble, the first known motorcycle scrambling event, took place on Camberley Heath on 29 March 1924. The event, won by A.B. Sparks, attracted a crowd in the thousands and is considered to be the first instance of what later developed in the sport of motocross. During the Second World War, the Old Dean common was used as an instruction camp of the Free French Forces. The Kremer prize was conceived in the Cambridge Hotel in Camberley in 1959 after Henry Kremer toured a Microcell factory. Barossa Golf Club (now defunct) was located on Barossa Common. The club was founded in 1893 and continued until WW2. The Old Dean housing estate was built in the 1950s on the "Old Dean Common" for residents of heavily bombed Surrey-area's homeless after World War II. Many of the roads on that half of the Old Dean are named after areas of London, with the others named after places on the common. Camberley falls under the siren test area of Broadmoor Hospital, a secure mental hospital in nearby Crowthorne. The siren was installed following a public outcry at the escape of child-murderer John Thomas Straffen in April 1952. The siren is still tested every Monday at 10am. In 1969 there was an outbreak of rabies when a dog, just released from a sixth month quarantine after returning from Germany, attacked two people on Camberley Common. The scare resulted in restriction orders for dogs and large-scale shoots to carry out the destruction of foxes and other wildlife. After debate and delay (plans having been discussed for over half a decade), in 2006, a 7-acre (2.8 ha) mixed-use development west of Park Street named The Atrium was built of residential, leisure and retail buildings with wide pedestrianised areas and 683 public parking spaces. Its 217 mid-rise apartments split into courtyards in the Barcelona style. Fourteen new retail units face directly onto Park Street, opposite the Main Square shopping centre. Park Street has been pedestrianised and landscaped as part of the development. Leisure facilities include a nine-screen cinema, a bowling alley, a health and fitness club, cafés and restaurants. Various elements of The Atrium was opened during 2008, with the final elements, the main cinema and bowling alley, opening in October and November 2008, respectively. In 2009, the town's households were named by Experian as having the highest carbon footprint in the UK, estimated at 28.05 tonnes per household per year (compared to 18.36 tonnes for the lowest, South Shields). 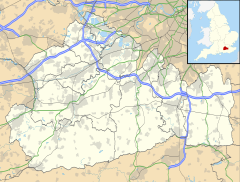 Camberley is in the far west of Surrey, adjacent to the boundaries of Hampshire's Hart district and Berkshire's Bracknell Forest district. It lies directly between the A30 national route and M3 motorway (junction 4 exit). It is at the northern edge of the Blackwater Valley conurbation, 5 miles (8.0 km) north of Farnborough, 8 miles (13 km) south of Bracknell and 17 miles (27 km) east of Basingstoke. The smaller town of Frimley, being so close to Camberley, is often regarded as part of the town, although the two are, for the most part, separated by the M3 motorway. Frimley has its own town centre, a major regional hospital (Frimley Park) and extensive suburban areas. In the 19th century, York Town and Camberley were in the ecclesiastical parish of Frimley. The exurb Blackwater, 3 km (1.9 mi) to the west is identified by the Government Statistical Service (including its ONS office) as within the Built-up-Area but is in the Hart District of Hampshire and has its own town council (both take in Hawley). The same could be said for Sandhurst which is home of "The Meadows" retail park which is in the Bracknell Forest borough of Berkshire. The Royal Military Academy Sandhurst is located in Camberley, despite the name suggesting otherwise. Camberley's town centre is host to The Mall shopping centre, built around the Main Square. This is a late 1980s development anchored by stores such as House of Fraser. The High Street has a number of shops as well as bars and clubs, many of the latter being more recent additions. There are a number of secondary shopping streets including Park Street, Princess Way and parts of London Road, including the "Atrium" development. Camberley’s town centre is set to improve as it is undergoing a regeneration project by the council. Major employers include Siemens, which moved its UK headquarters to the area in 2007, Burlington Group who moved into Watchmoor Park in 2009 and Sun Microsystems, until they were taken over by Oracle in 2010, whose UK headquarters was located just across the Hampshire border in Minley next to the M3 motorway at junction 4a. Krispy Kreme UK are based in Albany Park, an industrial estate to the south of the town centre. The town has its own public library, museum, cinema and theatre and is home to the Surrey Heath Borough Council offices. The Vue cinema opened in The Atrium development in late 2008, the year after an older cinema, owned by Robin's Cinemas, and on London Road some distance from the town centre, burned down in 2007 after having closed in 2003. The town's theatre, Camberley Theatre, is owned and managed by Surrey Heath Borough Council. The arts venue/receiving house comprises a 408-seat auditorium, conference rooms, studio theatre and multi-media editing suite. The programme of the theatre comprises music concerts, contemporary and classical drama, comedy evenings, an annual professional pantomime and cinema films. The theatre is also used by local recreational actors, musicians, landscape artists and dance schools, advertising all tickets on its own website for productions. A familiar landmark in Camberley is the concrete pipe white elephant which is on the A30 approaching The Meadows roundabout. This was created as advertising by a pipe company which rented the premises. When they closed down, the upkeep of the elephant was written into the tenancy contract, so subsequent businesses have continued to look after it. Camberley railway station is immediately south of the commercial centre on the Ascot to Guildford line, connected to Guildford, Aldershot in the south and Ascot to the north with two trains per hour in each direction. Between the radial South Western Main Line and Waterloo to Reading Line, capacity and stock constraints limit the direct services to and from London Waterloo to peak hours, running via Ascot and increasingly urban towns of Staines upon Thames, Twickenham then Richmond. In non-peak times passengers from Camberley change at Ascot or Ash Vale for London. A few miles south-west and connected also by bus, Farnborough station provides direct trains to Waterloo, Basingstoke, the medieval city of Winchester and on a lower frequency, Portsmouth. Directly west Blackwater station (close to the A30) on the North Downs Line is operated by Great Western Railway, with trains running to Reading, Guildford, Redhill and Gatwick Airport. Bus companies operating routes through Camberley include: First Berkshire & The Thames Valley to Bracknell; Arriva Guildford & West Surrey to Guildford via Woking; Stagecoach South to Aldershot, Basingstoke and Farnborough; and Dicksons Travel to Staines and Woking. Camberley's northern parts such as College Town are astride the old south-west road (A30) and the whole settlement is between Junctions 3 and 4 of the M3 motorway. There are two small airports nearby: Farnborough Airfield at Farnborough and Blackbushe Airport. Farnborough Airfield is well known for its International Air Show. Heathrow is 25 km (16 mi) as the crow flies. The A30 leaving Camberley to the north for Bagshot has a large junction named the "Jolly Farmer Roundabout" named after the Public House that stood on it. The pub was originally called "The Golden Farmer", after a local farmer and highwayman, William Davis. The nearest universities are Royal Holloway, University of London which is 18 km (11 mi) east of Camberley in Egham, with the University of Surrey (at Guildford) and the University of Reading both being 25 km (16 mi) to the southeast and northwest respectively. Camberley has an active sporting scene, mainly based around clubs and sports venues such as The Arena, a leisure centre and pool facility close to the town centre. Camberley and Farnborough Hockey Club plays men's and women's field hockey at Kings International College and draw many players from the region. The Men's 1st XI have recently secured back to back promotions and currently play in the Hampshire/Surrey – Regional Division 2. The Ladies 1st XI play in Surrey Ladies Hockey League Division 6. The Club in total supports 5 men's teams, 2 women's teams, a mixed team and colts teams from Under 10's to Under 18's. Camberley Town football club currently plays in the Premier division of the Combined Counties League. The home ground is at Krooner Park, Wilton Road. Camberley Rugby Football Club  plays in the London 2 South West in English level 7 Rugby Union League. The home ground is at the Watchetts recreation ground, Park Road. Camberley Cricket Club  1st XI plays in the Surrey Championship Division 1. Formed in 1944 fixtures were initially played at the Royal Military Academy Sandhurst before moving to its current ground in Upper Verran Road. The club runs several teams on Saturday and Sundays and has a thriving junior section composed of both boys and girls. Camberley Midweek Cricket League is an after work cricket league that has been running for over 60 years. Members include cricket teams from local companies, schools and government organisations from Camberley, Frimley and Farnborough. Frimley Lawn Tennis Club offer social and competitive tennis. They play at the Watchetts recreation ground in Camberley. Men's, ladies and mixed teams play all year in the Aldershot and District LTA League. Both Camberley Chess Club and Camberley Junior Chess Club meet every Tuesday at the Camberley Baptist Church Hall, Frimley Road, Camberley, GU15 3EN. They were 2007–8 Berkshire League champions. They also compete in several divisions of the Surrey Border League and are current holders of the Bell Trophy. Farnborough & Camberley Cycling Club was formed by an amalgamation of the renowned Camberley Wheelers cycling club and Farnborough Cycling Club in 1969. The Camberley Wheelers had a history that went back to the 1920s or 30s. A current (June 2011) member of the FCCC joined the Camberley Wheelers in 1935. Camberley Kart Club was one of the first kart clubs in the UK started in 196 and behind Blackbushe airport and car auctions. TS Diadem (Camberley Sea Cadets) was founded in 1955 and recently moved to new premises in Gilbert Road, opened by the Earl of Wessex in January 2011. The average level of accommodation in the region composed of detached houses was 28%, the average that was apartments was 22.6%. The remaining households not accounted for above were temporary/caravans and shared households. The 2011 census showed that 63.4% of Surrey Heath residents considered themselves Christian. Camberley has churches of several Christian denominations, mostly Anglican, many of which are members of a Churches Together group. There is also a Jehovah's Witness Kingdom Hall in the town. A local Bengali Welfare Association has maintained an Islamic centre in Camberley since 1996. Plans to convert the former school building into a more traditional Mosque were subject to intense debate, resulting in the withdrawal of planning permission in early 2010. ^ Davis was tried and hanged at what is now the Jolly Farmer roundabout. ^ "Welcome to Surrey Heath". Surreyheath.gov.uk. Retrieved 16 September 2011. ^ a b c d Bennett 2009, p. 1. ^ Johnson, Charles (1814). The History of the Lives and Actions of the Most Famous Highwaymen … A New Edition. John Thomson & Company. pp. 28–29. ^ Farman, John (2012). The Short And Bloody History Of Highwaymen. Random House. p. 55. ISBN 978-1-448-12109-0. ^ "A tour through the whole island of Great Britain". Ebooks.adelaide.edu.au. Retrieved 16 September 2011. ^ Bennett 2009, p. 2. ^ "The Obelisk". Surrey Heath Borough Council. Archived from the original on 26 January 2013. Retrieved 24 November 2012. ^ Philip Ralph Johnston. "History of the Royal Military Academy Sandhurst". Philipjohnston.com. Retrieved 16 September 2011. ^ "Film script for Lord of the Flies". Script-o-rama.com. Retrieved 16 September 2011. ^ “Barossa Golf Club, Camberley”, “Golf’s Missing Links”. ^ Neil Pemberton (2007). "Mad Dogs and Englishmen". 57 (9). History Today. Retrieved 29 December 2013. ^ "Carbon footprint". Experian.co.uk. Retrieved 16 September 2011. ^ "Royal Military Academy Sandhurst Location". ^ Camberley Theatre official website Accessed 2015-04-09. ^ "Blackwater Valley bus timetables". Surrey County Council. 16 November 2012. Retrieved 24 November 2012. ^ "Lyndhurst School". Lyndhurst School. Retrieved 16 September 2011. ^ "Lyndhurst School Day Nursery". Lyndhurstschool.co.uk. Archived from the original on 8 October 2011. Retrieved 16 September 2011. ^ "Watchetts Junior School". Watchetts.surrey.sch.uk. Archived from the original on 21 August 2011. Retrieved 16 September 2011. ^ "Camberley Infant School". Camberley-infant.surrey.sch.uk. Archived from the original on 11 September 2011. Retrieved 16 September 2011. ^ "Crawley Ridge Junior School". Crawleyridge.net. Retrieved 16 September 2011. ^ "Bristow Infants School and Nursery". Bristow.surrey.sch.uk. Archived from the original on 11 September 2011. Retrieved 16 September 2011. ^ "Cordwalles Junior School". Cordwalles.surrey.sch.uk. 7 September 2011. Retrieved 16 September 2011. ^ "Camberley and Farnborough Hockey Club". Candfhockey.co.uk. Retrieved 16 September 2011. ^ "Hampshire/Surrey Regional Division 2". Retrieved 14 March 2016. ^ "Surrey Ladies Hockey league". Retrieved 14 March 2016. ^ "Camberley Rugby Football Club". camberleyrugbyclub.co.uk. Retrieved 24 March 2015. ^ "Camberley Cricket Club". camberleycc.co.uk. Retrieved 29 August 2014. ^ "Camberley Midweek Cricket League". ^ "Camberley Midweek Cricket sponsored by Manzil Indian Cuisine". Camberleycricket.com. 29 March 2011. Retrieved 16 September 2011. ^ "Camberley Lawn Tennis Club". Camberley LTC. Retrieved 16 September 2011. ^ "FLTC". Frimleyltc.org.uk. Retrieved 16 September 2011. ^ Camberley Chess Club. "Camberley Chess Club – Welcome – The Chess Club for Surrey, Berkshire & Hampshire". Camberleychess.co.uk. Retrieved 16 September 2011. ^ "Farnborough & Camberley Cycling Club". Fccc.org.uk. Retrieved 16 September 2011. ^ "Camberley Kart Club". Retrieved 14 March 2016. ^ "SeaCadets: Camberley, Farnborough & District". Camberleyseacadets.org. 11 July 2011. Retrieved 16 September 2011. ^ "CTC Member Churches". Churches Together Camberley. 21 June 2012. Archived from the original on 30 November 2012. Retrieved 24 November 2012. ^ "Camberley mosque plan rejected by council". BBC News. 11 March 2010. Retrieved 24 November 2012. Bennett, Mary Ann (2009). Camberley - A History. Phillimore & Co. ISBN 978-1-86077-557-4. Surrey County Council. "Camberley". Exploring Surrey's Past. Retrieved 31 May 2017. This page was last edited on 4 February 2019, at 19:32 (UTC).